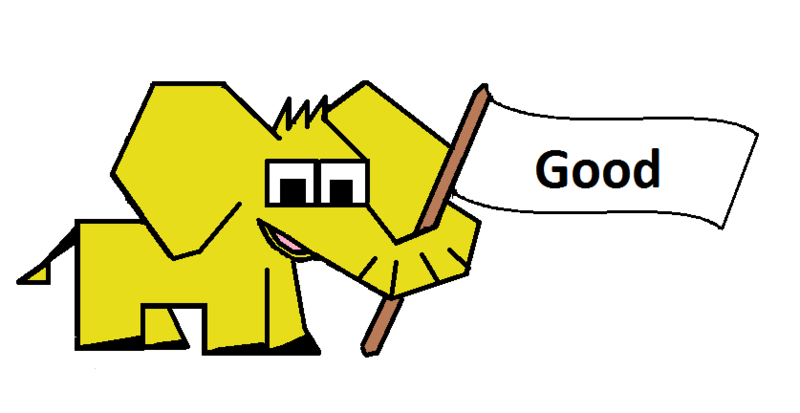 Get up! Blizzard rages all around and there is no time to waste. Sherpa wakes us from our sleep and his expression does not indicate anything good. There is five of us in a tent. According to the latest information, we are just two hours below the summit, but now everything has changed. We have to go back. Fear in his eyes speaks clearly to me, that life is at stake here. Yet some German tourist argues with him. He paid for it and wants to see the top at any cost. Distressed look of our guide says it all. He is trying to explain danger to an older gentleman, but he just keeps repeating his “Nein.” Finally stubbornness wins. Most of us starts descend and we are leaving two snowy silhouettes in the distance. I’ve never heard of these men ever again. 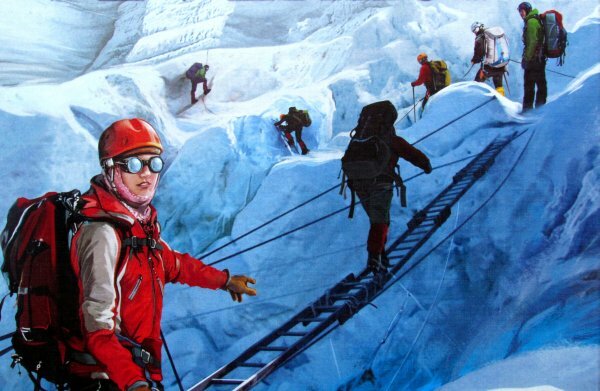 Where are those times, when climbing up the highest mountain in the world was a matter of prestige. 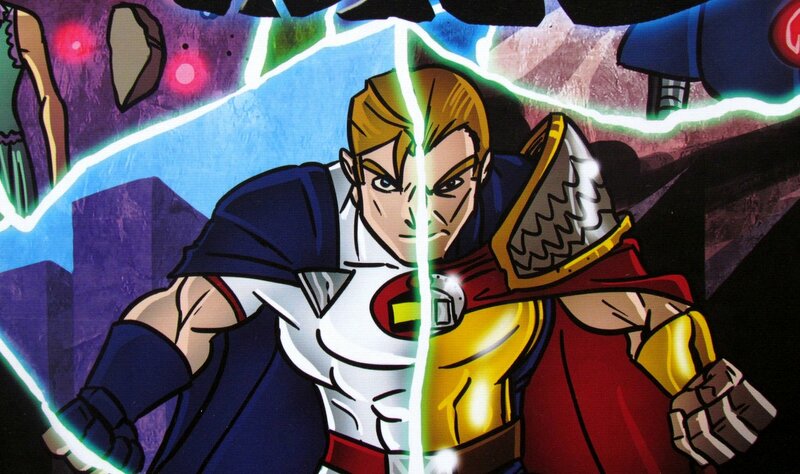 Today, all you have to do is have enough money and suddenly you are a hero and laymen climber. To do this, you need muscles, sweat and blood. Not your own, but that of a sherpa. 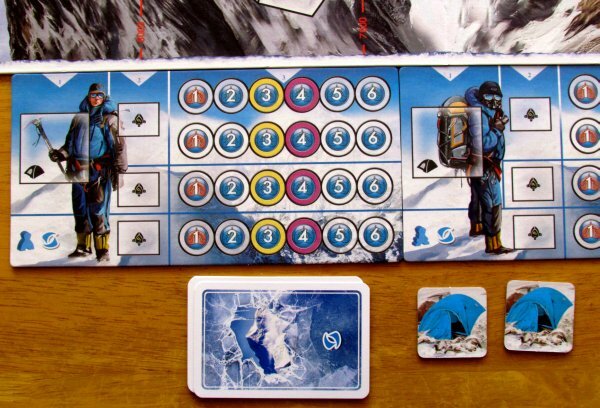 Famous guides are also main theme of new board game Mount Everest, which was presented at the exhibition Spiel 2013 in Essen by its author Adam Kaluza. 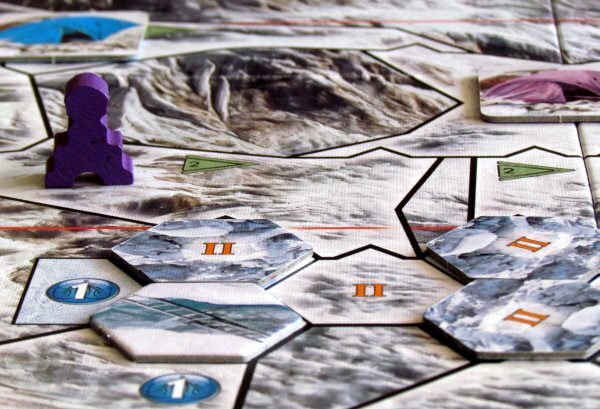 This polis designer is walking in footsteps left in the snow with his game K2 (review) and expansion of Broad Peak (review). All components were illustrated by Jarek Nocon and game could not come under flag of anyone other, than REBEL.pl company. Snowy white box with blue shadows from sun shows climbers on their way to get scalp of the highest mountain in the world. Box has a classic square shape, but its weight is definitely superior. Large double-sided game board also has an almost square shape and its sides differ in complexity and difficulty of the route for the players. There are several ways to the top, which are divided into sections – irregular surfaces on side of the mountain. To the right of it all is an altimeter, where players will record their achievements. 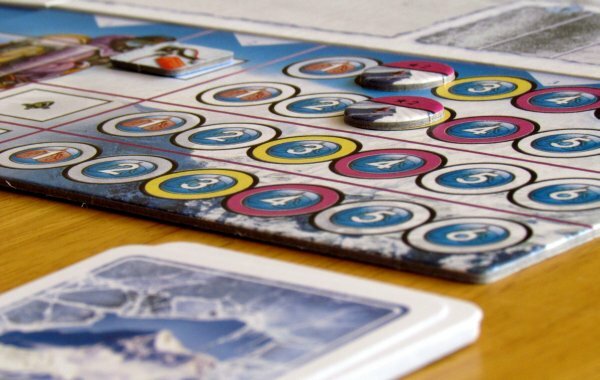 Necessary for the game is also a set of player boards – two in color of each player. Tourists themselves do not have their own cards, because focus is not on them. At least in this game. 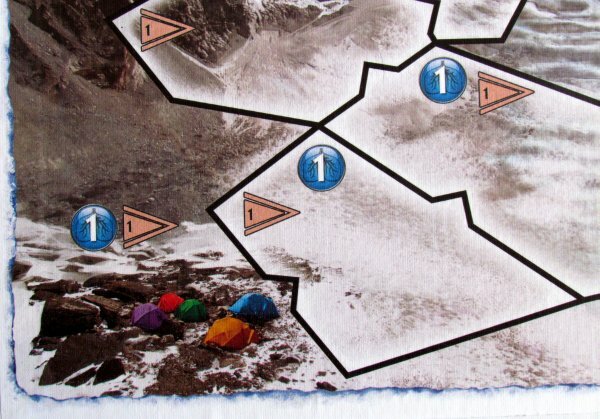 Boards have tracks describing health status of people you are leading (two for every one), while every sherpa has his own space for tent and equipment. And there have to be also pawns, who will climb the mountain – there are three for every contestant. 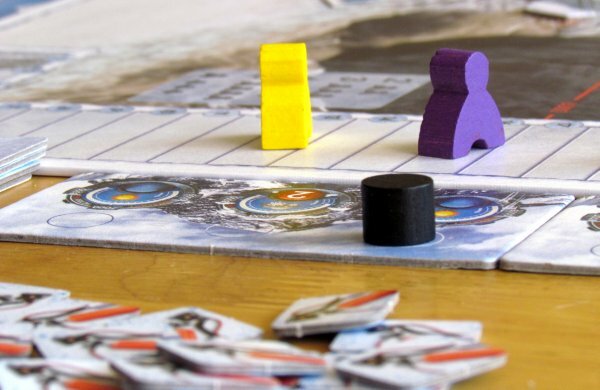 Along with large boards, cardboard sheets hide a dozen of weather pads, each with the three positions with influence on all, who are on the rise. Half of them represent sunny summer, while the second half of winter, which can be identified by icons and overcast clouds. 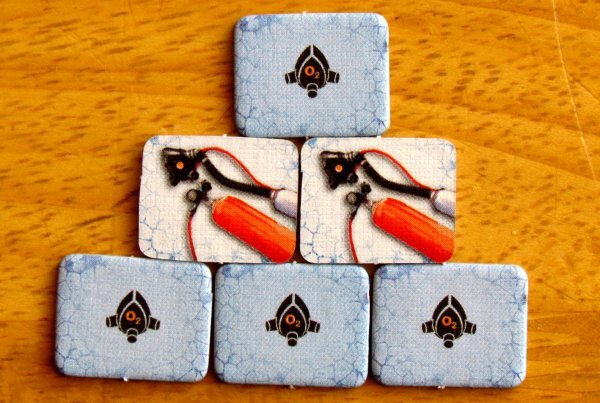 Players also discover camps pieces, risk tokens (20 pieces with values ranging from zero to two), but also tokens of clients (80), oxygen (30) and cave-ins. 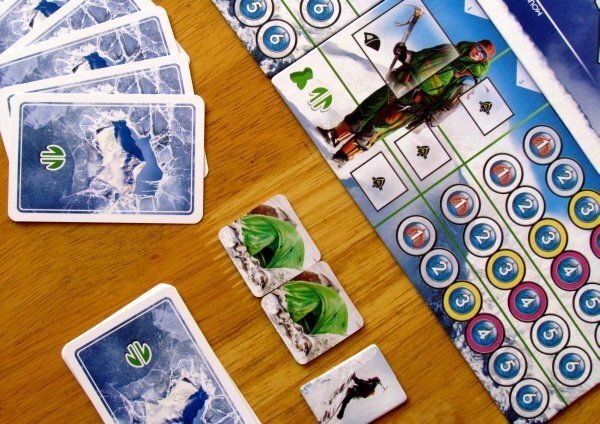 Game of course is complemented by a set of 120 cards, 24 for each of the opponents. 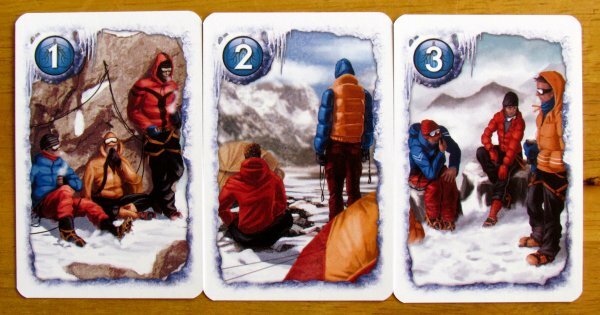 These cards serve as scheduling for climb, but also to plan a rest. 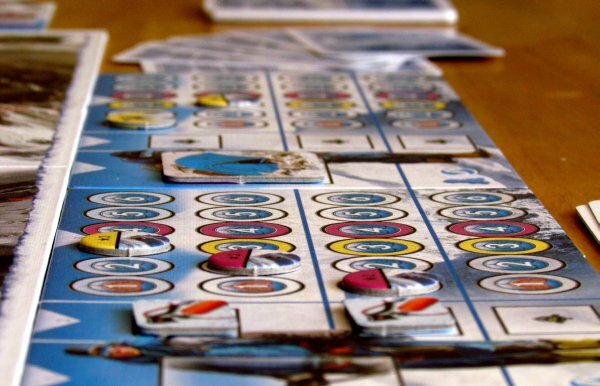 Preparation of the first game revolves primarily around the distribution of various tokens. In the pile of risks tokens, three are randomly turned face up. 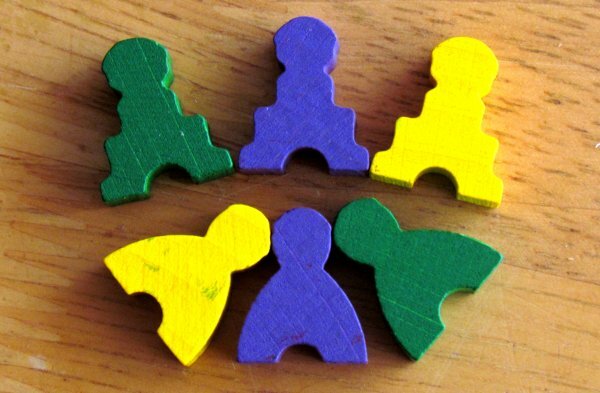 Players themselves choose the color, getting not only set of cards, but also a pair of board and pawns. 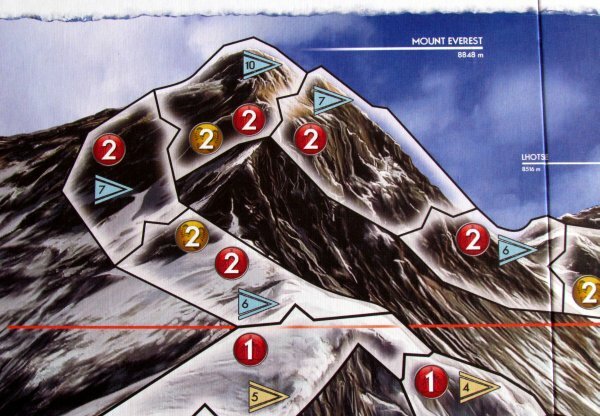 Two of them are placed to the base camp in the lower left corner of the plan and third in box indicating five points on scoring track. 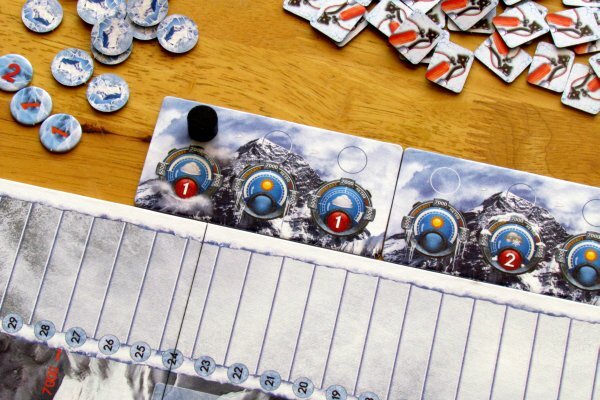 Players removes acclimatization cards from their deck and put them in a separate pile. The remaining cards are shuffled and every player draws six cards to start with. 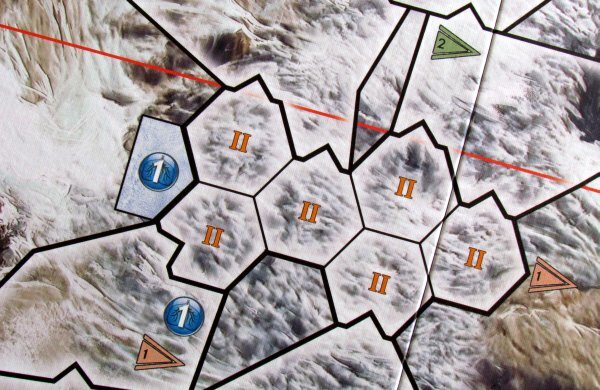 Along with the difficulty (board side), players must also choose weather, which further specifies requirements and demands of the survival on the slope of eight thousand meters high monster. 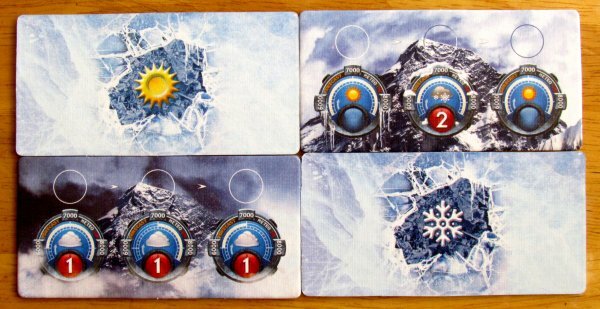 First two weather tiles are then randomly revealed and mix vagaries of nature for the whole game. 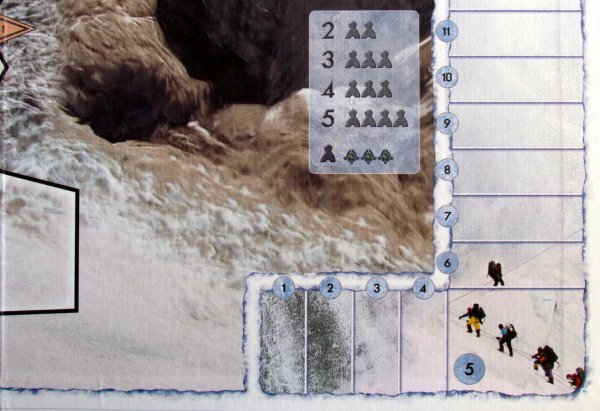 On each box with icefall, players randomly put one of the ice tokens. Entire battle takes place in the space of eighteen days, each turn corresponding to one day. In this amount of time, every player will have to become a sherpa. 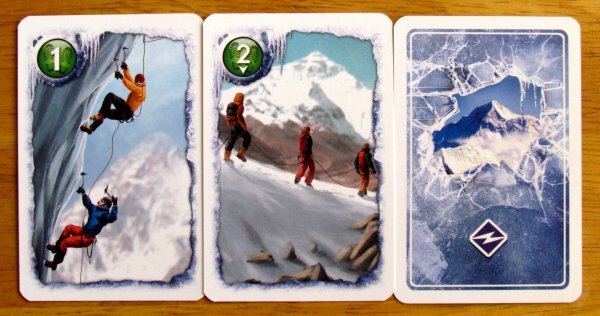 Each turn begins with a common choice of climbing tactics by secretly playing three of the six cards from hand. With picture down for now. Only when all players have made their choice, they simultaneously reveal cards and add up movement points on the cards. 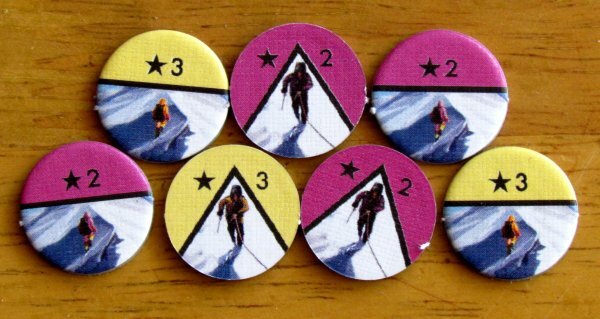 Most voracious climber must take one of three revealed risk tokens. 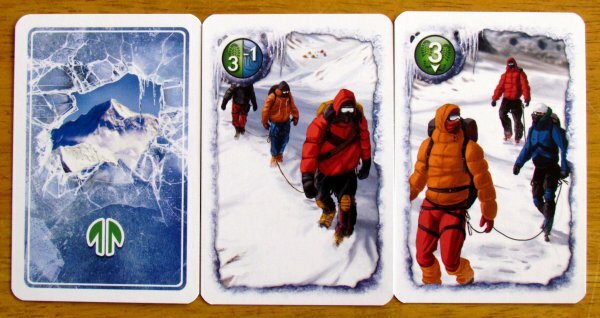 Only now all the sherpas get a chance to use their cards to move. 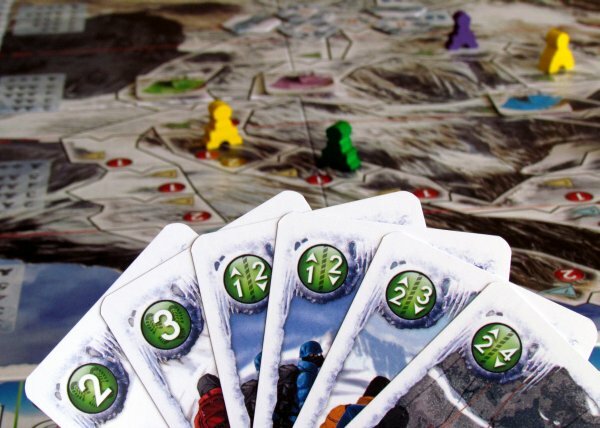 For this purpose is used green symbols on cards, which players apply for climbing to any other field (or to descent). 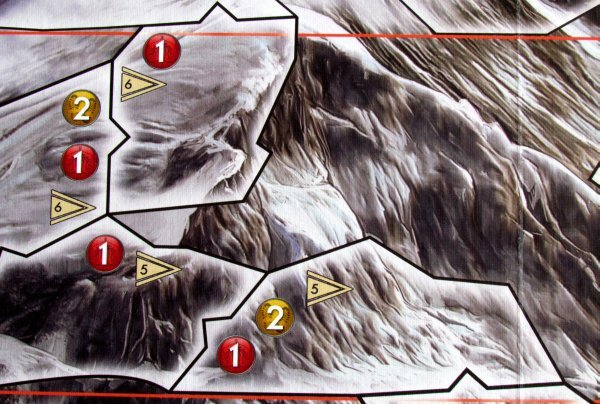 Most of the lower level spaces near base cost only one movement point to enter, but as climbers arrive over seven thousand meters, journey becomes harder with higher costs (higher energy costs are indicated by a yellow circle on the map). 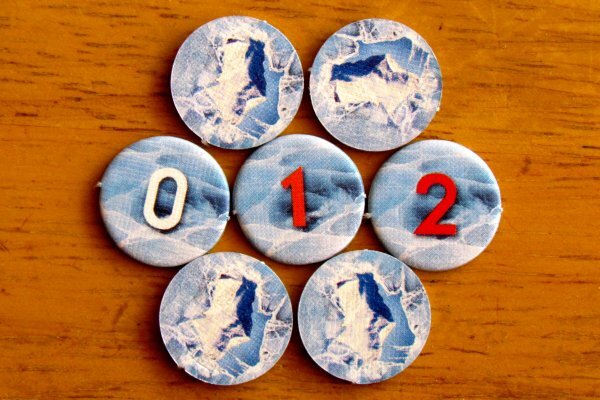 Red circle then comes into play and indicates a negative effect on acclimatization of tourists not only due to the altitude, but even because of bad weather. 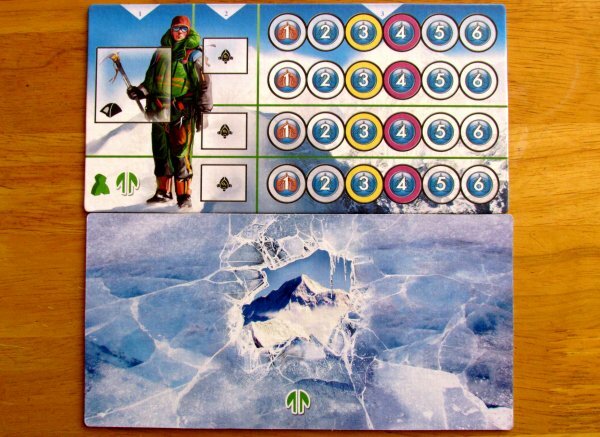 Their ability to survive in extreme conditions is observed on the sherpa boards.Players can use acclimatization cards to temporarily improve the condition of their wards. Camp or movement in basic heights can do the same. 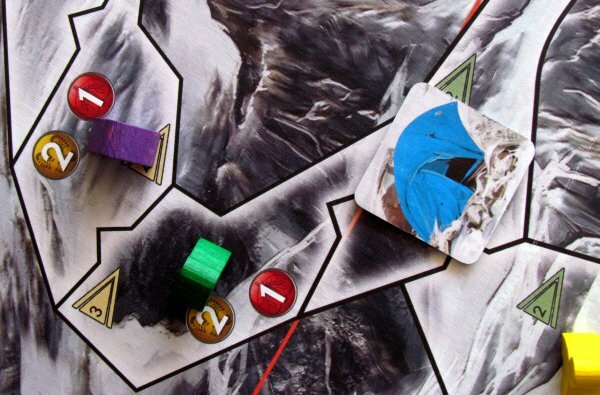 Whenever player finds himself in the base camp, he can pick up supplies, but also gain new clients, he will try to bring to the top of the mountain. He will be then moving on the mountain in group with them. Some places have limited capacity, as displayed by silhouettes on the side of the board. Whenever player manages to arrive with a client to the top, he gets two or three victory points (based on type of his client). If he succeeds to arrive back to camp with these people still alive, player gets the same reward again. Both this, its immediately recorded on the counter. 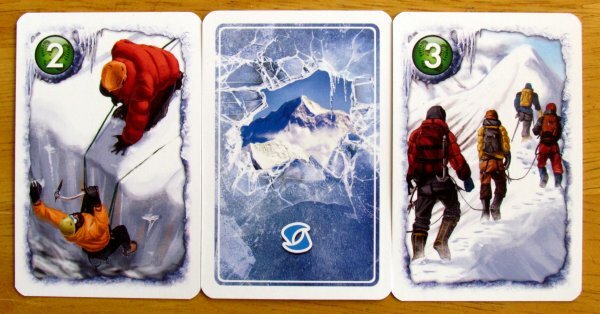 Once players have finished the last day, all sherpas compare their achievements and the one, who managed to please most clients, wins. 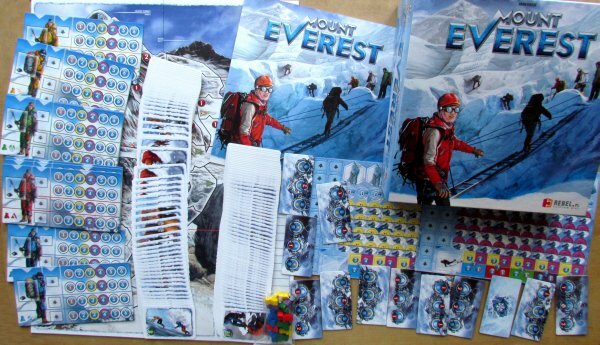 When we first opened Mount Everest box, we thought, that it is just a copy of successful climbing game. The more we were pleased, that we were wrong, because this game does use a similar mechanism, but it works completely differently. Main reason is, that players do not care about their own figures. It also follows a completely different feel and atmosphere of the game. This time, its not about survival, but ordinary business. Players are thinking about tourists as their goods, which is necessary to get up and maybe also down. When they fail to deliver, nothing actually happens. They simply get down and pick up next one. Of course the death of wards is governed with point penalty. Thanks to this, theme is not so successful as in the original game. Your life is not at stake here. But it’s really a matter of opinion, because all this substantially corresponds to reality. Although sherpas are also people, like we have seen some time ago. 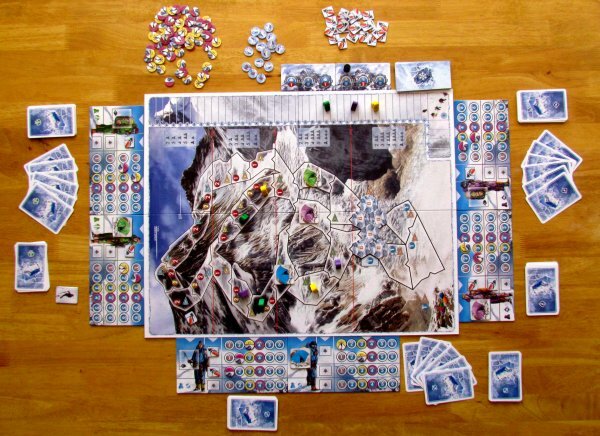 At the beginning of the game, players usually prepare terrain in the role of Sherpas and only then true adventure begins. Very important are oxygen cylinders, that represent a single dose of beneficial air up there, where oxygen is scarce. At the same time, players must be careful with movement, trying not to be the fastest. Only this rushing sherpa gets a penalty, which is another interesting element of tension. Pursuit of excessive speed on dangerous slopes is simply not, what you should be doing in reality. 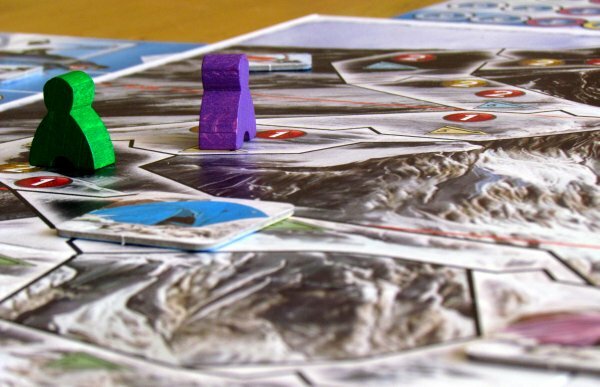 This game is from start to finish about heavy decisions. 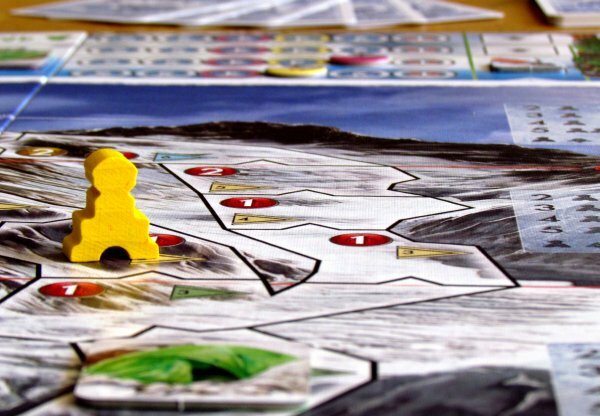 It’s not just about cards to play, but you have to take notice of the situation on the board, forecast and be able to plan properly around these informations. 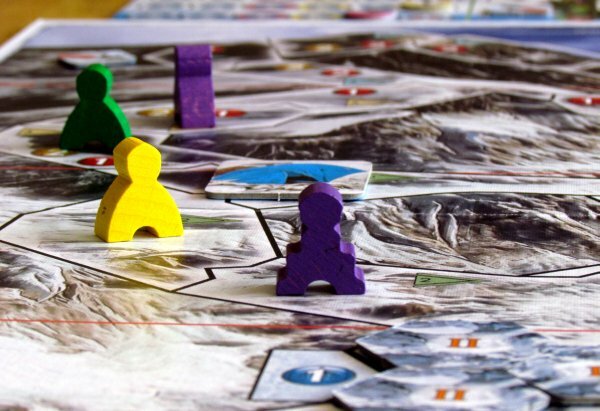 Due to limited space, players can easily block each othere, plus there are two levels of clients – experienced climbers for fewer points, and then paying customers for more. But you have to literally pull them up, as they have lower acclimatization maximum. This is bound with greater risk, that you lose them somewhere on the way. 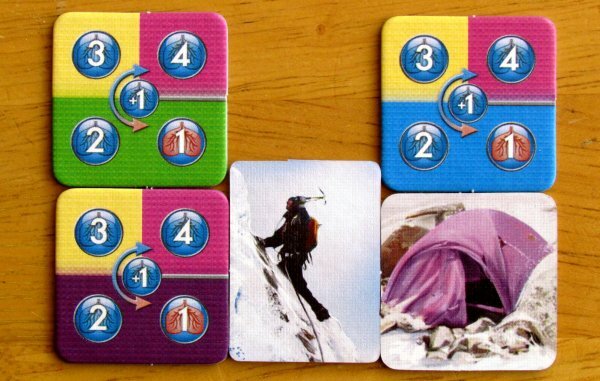 Mount Everest has very well adjustable difficulty level. 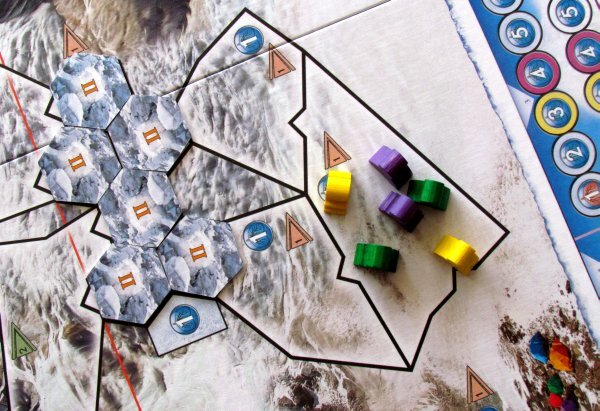 Not only there are two sides of the board, but also two levels of weather. 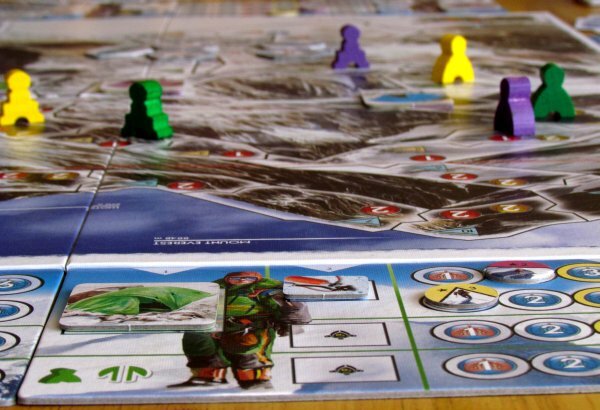 Variability of individual games is nice due to random distribution of weather tiles, icefalls and risk tokens. Game has almost no interaction, which is also the biggest shortcoming of this whole mechanism. Scoring works differently this time. When you do not reach the top, you do not get any points. It changes the situation and tactics against the original game. Scoring system requires much more from players. Eighteen rounds guarantee a balanced game length. At the same time it also means, that time is not shrinking anywhere with experience and you always will be around one hour, while with more players, you must count with at least fifteen minutes more. Number of players have no significant impact on gameplay, since there is no interaction. 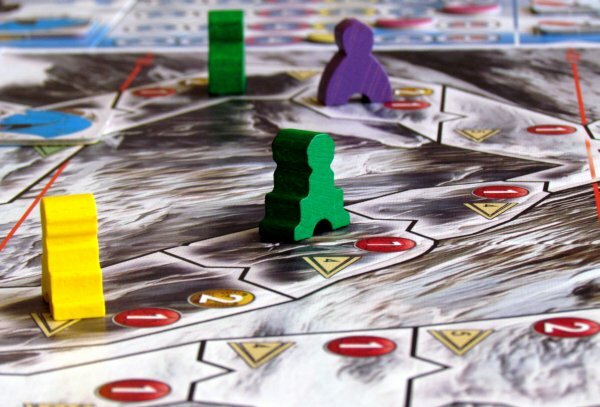 Only waiting for next turn will be longer, but game has enough planning to guarantee fun even outside of your turn. In addition to everything we have said, there is still a mystery. This is a question, that might already have occurred to you. And the answer is YES. 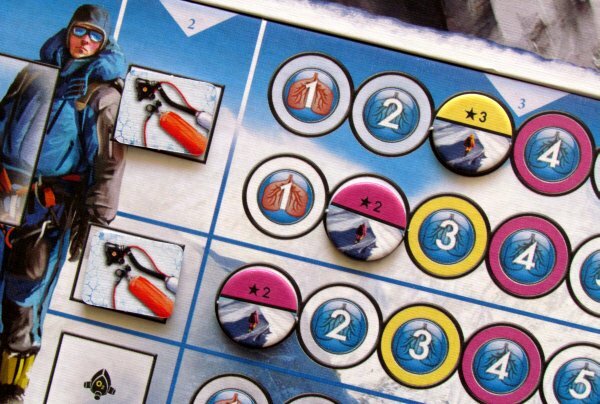 These new boards can really be used as expansion for K2. That’s, why they also have flags in every box, that indicates number of points for reaching them. 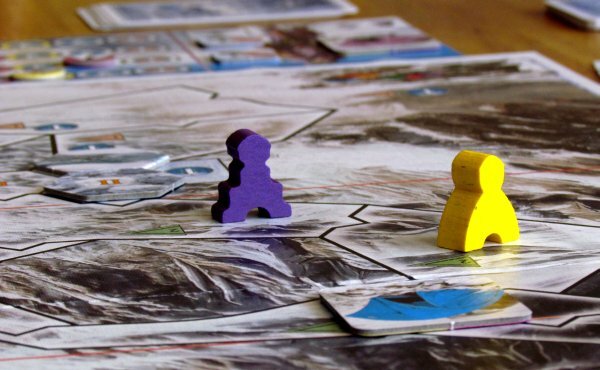 Mount Everest offers such tension as his older brother and game is much more calm and slow. But the tactical possibilities are really so rich, that players will have really hard time. 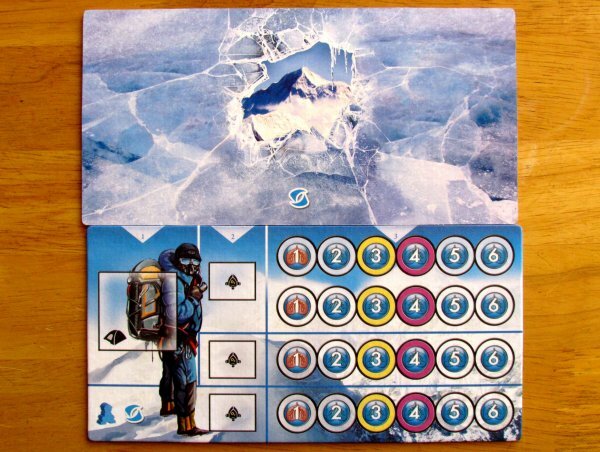 Thanks to this, Mount Everest is a solid achievement, which has the right to exist side by side with a second similar game. It provides an interesting option to choose from. 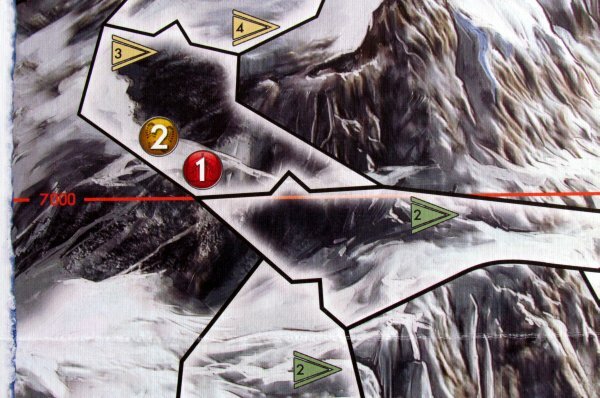 And still, if you have K2, then probably its worth buying mainly because of the beautiful map and their compatibility. On the contrary, as first purchase out of these two, we would recommend you to prefer the original K2. 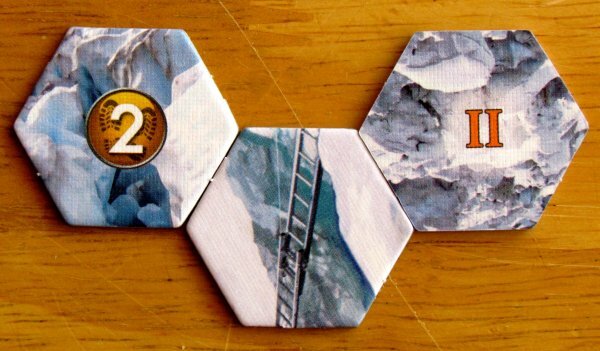 Mount Everest is a different game than K2. It brings more tactical point of view, which focuses primarily on the player himself. Missing is the effort to get better and climb higher, than your opponent. Likewise, atmosphere is different, when players try using their cards to keep clients alive, yet themselves are not in any mortal danger at all. 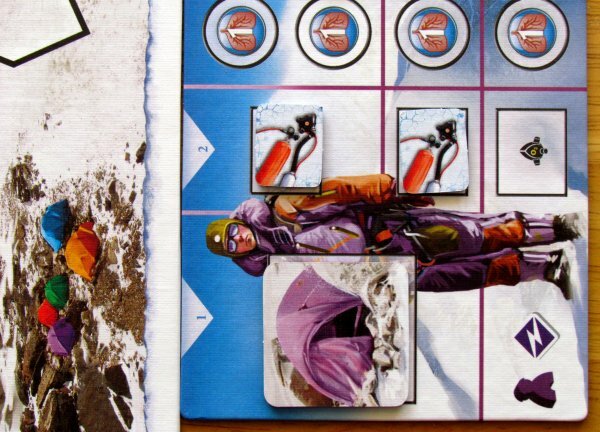 The game is a hunt for victory points, with four versions of difficulty and can be really hard even for advanced and experienced climbers. Whole mechanism is fun, but especially the graphics is detailed and looks great. 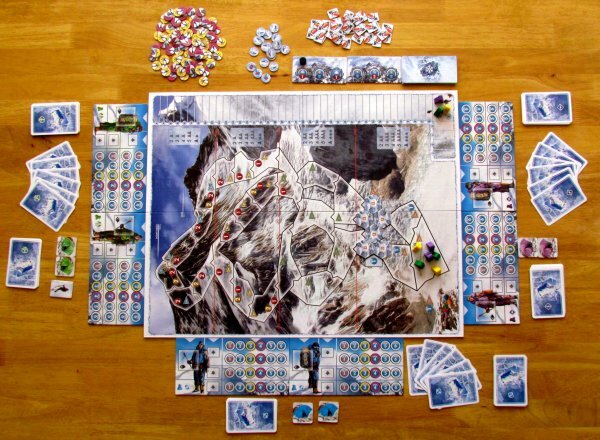 Mount Everest, although letting each player to play on his own turf, certainly deserves praise for an interesting topic and a chance to look at the top of the highest mountain in the world.